Think: Slack meets buffer for images and videos. Normally, this type of content would need to go through several stages of approval. Viraltag's new 'Collaboration' feature will hasten this process. For busy social media managers, images and video are typically planned in a very un-social way. Offline tools like Excel are used to keep track of what images to share and when, leaving teams to work between multiple, fragmented solutions. Viraltag has reinvented this antiquated system with a shared, team-centric platform. Think: Slack meets buffer for images and videos. 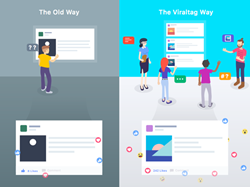 “Social media is all about creating conversation, so we applied that spirit of collaboration into the development of this new feature to help teams collectively improve the quality and effectiveness of their posts,” said Sudheer Someshwara, Viraltag founder and CEO. Using Viraltag, teams discuss content and gain efficiency with one-click cross-channel promotion, and marketing departments gain a transparent view into social media ROI. Clients including Conde Nast, Hearst Corporation, AOL Entertainment, Lacoste and H&M rely on Viraltag to share optimally formatted images at the most opportune times to boost engagement and brand credibility. With Viraltag, draft posts are created and dropped into a real-time collaboration dashboard for comment and review, and team members receive alerts when feedback is given. Administrators can then review suggestions, make changes and approve a post, before releasing it to a scheduling queue. Performance data is aggregated across all social channels for each image and campaign, which the connected team can then use to measure asset effectiveness, and improve future campaigns. In Q4 of 2017, Viraltag will introduce integration for AI and chatbot technology, building on the company’s mission of incorporating best practices and emerging technologies into a single platform for quality-focused social media managers and brand marketers. Viraltag helps social media managers and brand marketers be more efficient when planning and managing visual campaigns in social media. The top choice of more than 3,000 global publishing and ecommerce clientele, including Hearst Corporation, Condé Nast, AOL Entertainment, Lacoste and H&M, Viraltag is obsessed with solving clients’ problems by integrating the latest technologies into its all-in-one platform for visual assets management.